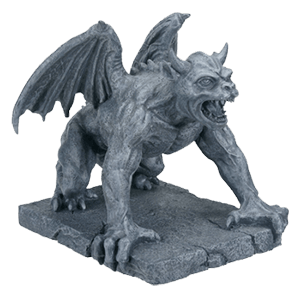 Gargoyles are one of the most highly recognizable gothic symbols from the medieval era, and we are happy to offer an absolutely staggering selection of impressive gargoyle products. Gargoyles are typically classified as grotesques, which is as much a reference to their intriguing appearance as it is to their function. Originally, gargoyles were designed to be decorative water spouts that drained water away from walls to prevent damage, although as time went by, legends and myths about these creatures began to spring up as well. One of the more popular myths is that gargoyles offer protection against evil spirits, as their fearsome appearance wards off evil, fighting fire with fire, in a manner of speaking. Adding on to that myth is the popular depiction of gargoyles coming to life after sundown, where they take flight and continue their vigil against evil spirits only to return to their perch at sunrise where they become stone again. We offer a wide assortment of different gargoyle items ranging from traditional gargoyle statues to impressive gargoyle tables. Gargoyle home decor is great for adding either a medieval and gothic feel to your home, whether you are decorating a few rooms indoors or the garden just outside your windows. 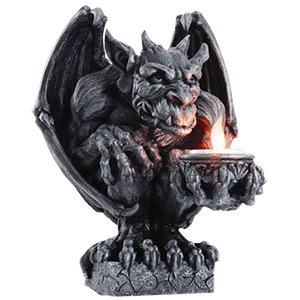 Gargoyle lamps will keep your home bright and illuminated, while other pieces of gargoyle home decor are perfect for adding that little touch of gothic gargoyle style you might be missing. They make great gifts too, provided that you know someone who loves the gothic look of a traditional gargoyle! So if you are looking for a place to get your gargoyle fix, then you have found just the right spot, because there are gargoyles aplenty in our gargoyle statues and collectibles category! It is hard to say if these gargoyles come to life when the sun goes down, if only because they are so realistic to begin with! We offer an absolutely huge selection of great gargoyle statues, so much so that we are certain that we have a gargoyle statue for you, whether it is a goofy one, a grotesque one, or a ghastly one. Of course, no matter what they look like, you can certainly bet that these gargoyles are great display pieces to have sitting around the house, not only because of their stunning look but also because gargoyles of all sorts are rumored to keep evil spirits at bay. No one really needs more evil spirits in their life now, do they? Each and every one of these medieval gargoyle statues is impressively detailed, featuring a hand painted look that makes each look like authentic stone, further enhancing its realistic look. Many are chimeras, or strange amalgams of creatures, possessing the features of several different beings all merged into one form that lives up to the gargoyle name of a grotesque. As odd as some of them are, though, they are all still great displays to have either set up in your home or office or displayed in your garden where they will serve to enhance the gothic look and feel of your surroundings. If you are looking for something spooky and sinister, you might want to pick up one of our angry gargoyle statues or one of our fearsome gargoyle statues. In contrast, if you are looking for something light-hearted and fun, one of our baby gargoyle statues or one of our foolish gargoyle statues will suit you just fine, as well. When it comes to the gargoyle statues offered here, you never quite know what you will find. Not all gargoyles guard ancient cathedrals and medieval castles. Some, like these gargoyle ashtrays, are more suited for guarding smaller things, like cigarettes or other tiny trinkets. Of course, the gargoyle ashtrays here do more than just guard things, though, as they also are fantastic decorations to have sitting around your home. Like the classic gargoyles of gothic design, these creatures are strange amalgams of various shapes, many of which are quite intriguing to the eye. Each one is also accompanied by a bowl or container of some sort perfect for containing a wide assortment of things, ranging from cigarettes and ash to small trinkets and things like coins, paper clips, loose change, keys, and more! These gothic gargoyle ashtrays come in a wide variety of shapes, ranging from gargoyles that look as evil as the sinister spirits that they are supposed to ward off to more peaceful gargoyle ashtrays that depict fantastical creatures that will surely wow and awe all those who see them. In spite of the myth about gargoyles turning to stone during the day, not all gargoyles fear the light. Some, in fact, favor it, and those are the gargoyles that occupy our collection of gargoyle candleholders. Our gargoyle candleholders all feature a number of different styles of gargoyles, although almost all display a common interest in both light and fire. Our gargoyle candleholders come in a wide variety of shapes and sizes. Some hardly even look like gargoyles at all, possessing the distinctive features of earthly animals, like wolves and lions, although their somewhat monstrous features and stone colorings are what make them more gargoyle then mundane beast. Others, however, are classic gargoyles at their finest, depicting strange amalgams of animals in a monstrous yet mythic form that is both eye-catching and eerie, especially when the light of a small flame glints off of its features. Our gargoyle candleholders come in various sizes, too, with some being more suited for small tea light candles and others made to accommodate larger candles, like tapered candles or scented candles. They are perfect not only for adding that extra touch of real gothic style to your home, but also for allowing you to add an extra light to your home as well. After all, what hallway, sitting room, or bedroom could not use an extra bit of ambient lighting that only a candle can provide? Our gargoyle candleholders make fantastic home decorations that will certainly awe onlookers, as well as great gifts to present to anyone who is fascinated with such works of surreal gothic art. Perhaps you are looking to decorate your home with gargoyles and you do not know where to start. If that is the case, then you have come to the right place. We have much in the way of gargoyle home decor so that you can get that gothic or medieval look and feel you want by having a gargoyle displayed in any room. Gargoyle home decor is a rather wide definition, though, so it is best to break it down and tell you what exactly falls into this section. Here you will find all manner of distinctive items that are typical of home decoration and all imbued with decidedly gargoyle style. Instead of the common items, like trinket boxes, candleholders, and lamps, you will the more eccentric items. We offer gargoyle thermometers, which are perfect for hanging on a wall near a vent so that it can always tell you how hot or cold the room is. Our gargoyle picture frames will safeguard the image of anyone you wish to protect. We even carry gargoyle doorway plaques, shelves, book ends, fountains, and so much more, making it easy to decorate with gargoyles without having to fill room after room with just gargoyle statue after gargoyle statue. Every single piece is so incredibly detailed that you might think each and every one was a real gargoyle stolen from its perch on some medieval castle or Gothic cathedral! So if you are looking to decorate with gargoyles or seeking a gift for that special someone who enjoys the look of dark decadence and distinctive class, you might find something for them here in the gargoyle home decor section, too. In one legend of the gargoyle, the creature is more dragon-like and can breathe fire. Rest assured, none of these gargoyle incense burners actually breathe fire. But they will happily help blow a lot of fragrant smoke around as holders for your favorite sticks of incense. An incense burner is really a personal accessory. It can be as simple or as complicated as you want it to be, and if you really want it to speak volumes about your taste, then you will want to be quite the sight to behold. 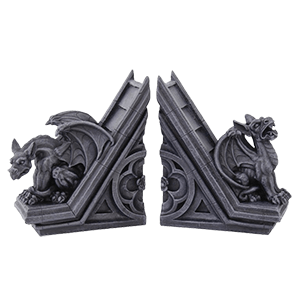 Thus, if your interests are gothic and medieval, you will love these gargoyle incense burners. They depict classic medieval gargoyles and other chimeric beasties as they sit ready to accent a stick of your favorite incense. Each one is incredibly detailed in appearance and is perfectly safe for use with stick incense. Some even feature dishes for burning cone incense, as well. 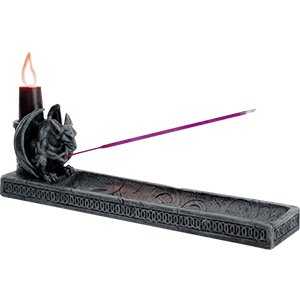 So if you would like to engage in a little unique aroma therapy in the comforts of your home, there is no better way to do so then with one of our gargoyle incense burners. Gargoyles are natural guardians, and so that makes them the perfect choice when it comes to securing away all of your little trinkets. It also does not hurt that each one is also an impressive display item likely to wow your guests and visitors. Intricately detailed and amazingly styled, some of these gargoyle treasure boxes look like miniature castles or fortifications defended by gargoyles just like ancient structures used to be. Others depict gargoyles in a variety of other situations, ranging from gargoyles on tombs to gargoyles reading books. 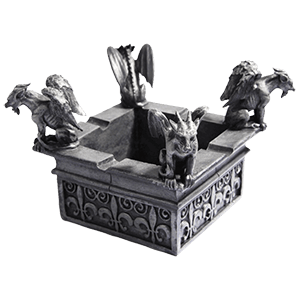 These gargoyle chests, mini gargoyle tombs, and gargoyle coffin boxes are great for storing away your gothic jewelry. You can also use a good gargoyle box to contain other small items too, including things like loose change, small trinkets, collectible coins, and tiny keepsakes. These gargoyle jewelry boxes also make great display items, so much so that guests may not even recognize them as storage boxes and will instead admire them as unique decorative pieces that are quite appealing to see. 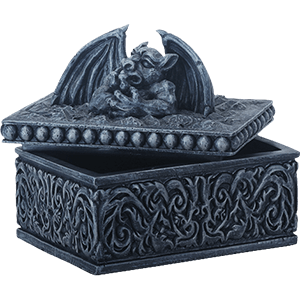 These gargoyle trinket boxes are great to have on hand, whether you are using them to store away small goods or not, especially when you are a lover of dark, gothic, and medieval style. All a gargoyle has is time, especially when it is spending the long hours of the day trapped in stone. That makes gargoyles and sandtimers a perfect pairing, as evidenced by our selection of gargoyle sandtimers. Not only perfect for peacefully watching the time pass by, our gargoyle sandtimers make great display pieces. Our gargoyle hourglasses and sandtimers come in a variety of shapes and styles, ranging from classic hourglasses that feature gothic gargoyle accents to stunning fixed-base sandtimers that have a rotating hourglass at the center. Each and every one is impressive in its detail, possessing a look and feel that will lead others to believe that they are made of stone or that they are real, miniaturized gargoyles! 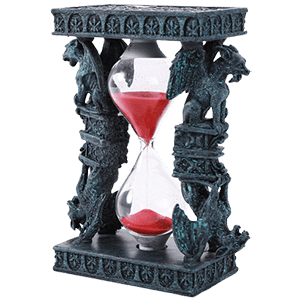 Whether it is an independent hourglass or a fixed base sandtimer, these gargoyle home accents are great for timing things like turns in chess games. Each sandtimer can measure a different length of time, though, so please be aware that not all sandtimers measure the exact same period of time. Of course, you do not have to use them as functional sandtimers. You can, instead, just use them as brilliant and decadent display pieces. They perform remarkably well in this capacity, serving to capture the eye of whoever looks their way. And that makes each of our gargoyle sandtimers great gothic decorations to have, as well as great gifts to give to those who like the wild world of eerie and gothic medieval decoration.